Grimsby Town have completed the signing of midfielder Bryan Hughes on a contract until the end of the season. 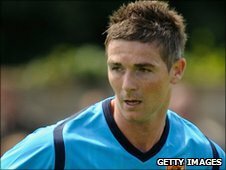 The 34-year-old was a free agent and had been training with Grimsby for the past two weeks. Hughes started his career with Wrexham and starred in the Red Dragons' run to the FA Cup quarter-finals in 1996-97. That earned him a move to Birmingham City, where he scored 42 goals in 291 appearances, before spells with Charlton, Hull, Derby and Burton.